Mike McQuillan's first book will be available soon! Do you quake at the sight of a SELECT statement? Start to shiver when people start talking about tables and rows? Fear not, Introducing SQL Server is here to rescue you. The book focuses on the knowledge and skills needed to begin your journey toward becoming a solid and competent SQL Server professional and database programmer. You’ll learn the core concepts of SQL Server, from installing the software to executing and profiling queries. 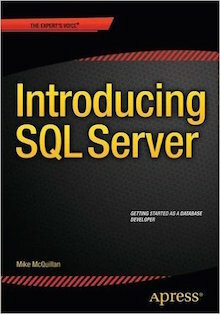 Introducing SQL Server is aimed at SQL Server newcomers as well as those who want to improve their database skills. You’ll put a comprehensive database together as you work through the book. You will create tables and learn how to use constraints; create reusable functions and stored procedures; and even learn how indexes work and what they bring in terms of increased performance. Introducing SQL Server shows you that databases don’t need to be difficult. The book is available to order from Apress and Amazon. If you've already bought the book and are looking for the files mentioned within it, you can download them here! Files are available separately or together in a single zip file.